Devon & Somerset Fire & rescue Service are launching their latest campaign aimed at residents who live in flats and buildings with communal escape routes reminding them that they have a voice. This campaign supports the recommendations of the Dame Judith Hackett report into the Grenfell Tower fire, by giving a voice to residents. The campaign seeks to inform residents that if they have concerns about clutter/storage in their means of escape, they should in the first instance raise these concerns with their neighbours. If this does not bring any results then inform their landlord or the management agency, or refer the matter to their local housing authority. If for any reason they cannot speak to a neighbour or landlord about Fire Safety concerns, they can contact Devon & Somerset Fire & Rescue Service on the number or email below. All correspondence will be treated with the strictest confidence. All communal areas must be kept clear of storage of any type and size. This includes waste (refuse), abandoned materials, bicycles, prams, and mobility scooters. To ensure as many residents as possible receive the Fire Services campaign message firefighters across Devon & Somerset will be delivering posters (attached) to landlords/management agencies and local housing authorities. Ensuring all passages and corridors (escape routes) are clear of clutter is an ongoing issue within communal properties. 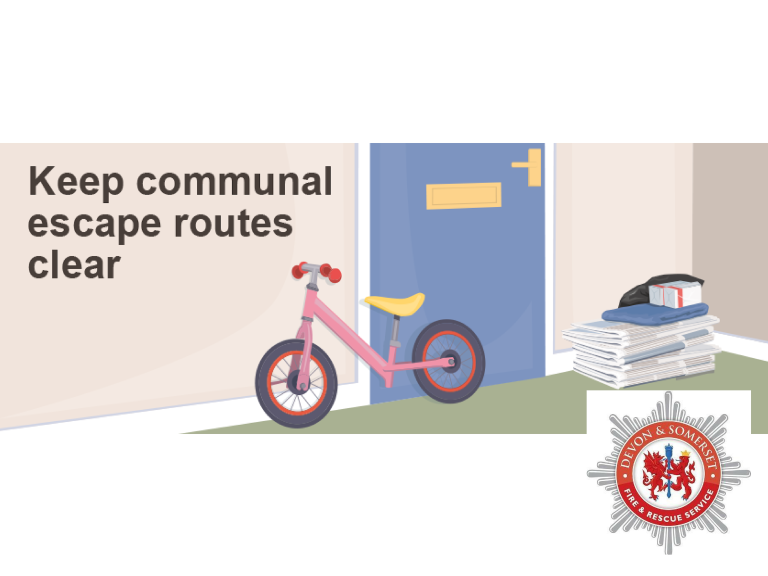 Devon & Somerset Fire & Rescue Service are committed to making sure the community and visitors to the area it serves are safe from fire in communal escape routes. If a fire were to start in a communal space which is full of clutter/storage the escape routes for the residents could prevent or hinder the safe evacuation of people leaving the building. Clutter/Storage also invites the risk for a deliberate fire being started. Clutter/storage in escape routes could also affect the speed the fire service would be able to resolve the fire as well as blocking firefighters rescuing the occupants.